Ocean and coastal conservation, management and policy are impacted by expanding coastal populations, increased exploration of resources and climate change; solutions to address these problems are urgent. However, the ocean and the resources therein cannot be understood or managed solely within administrative boundaries. Ultimately, the success of place-based coastal and marine conservation depends on the management of whole marine ecosystems, covering the management of social and economic activities. This is the reason sustainable management of marine conservation areas must be implemented within the context of wider integrated ocean management, i.e. at the marine ecosystem scale (ecosystem approach/ ecosystem based management). To address ocean management and conservation, research and knowledge on environmental, social and economic aspects, needs to be combined in order to address the cumulative impacts and interactions of multiple stressors on marine ecosystems. While addressing management problems and searching for solutions, the following question is often asked by managers: “Who is doing what?”, and “where?, and when?, and what for?“. It is often the case that access to actors, information, knowledge, and even ocean expertise is fragmented, as knowledge and people are scattered – in terms of territory, discipline, sector, and jurisdiction. Because of this fragmentation the research and management community face challenges in finding and synthesizing the necessary knowledge to address complex socioecological issues. The talk highlights the advantages of the ecosystem approach to address ocean and coastal problems and identifies a fourth dimension in sustainable ocean and coastal development: governance. The talk concludes with the presentation of the Future Ocean AllianceTM (FOATM), which was being created with the goal of strengthening the research and science-policy dialogue on ocean governance by facilitating and promoting the collaboration among networks of producers and users of knowledge. 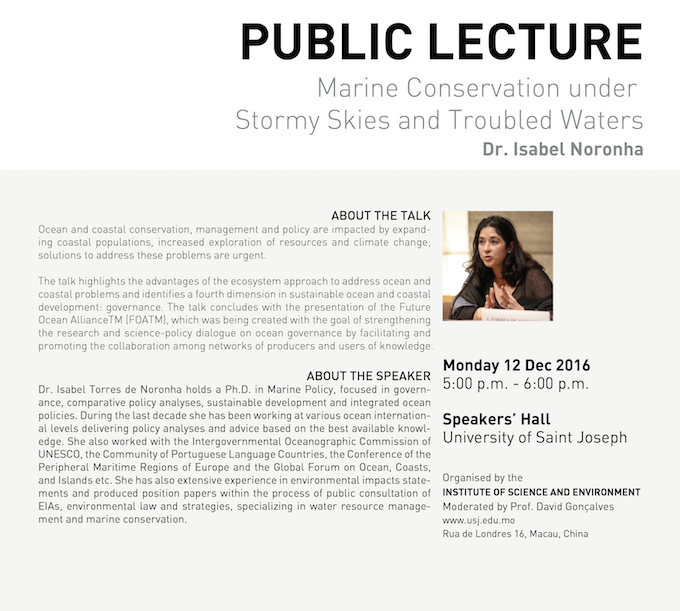 Isabel Torres de Noronha has been a very active member of the ocean community for the past two decades. During the last decade Dr. Torres de Noronha has been working at various ocean international levels delivering policy analyses and advice based on the best available knowledge. Among other activities, she worked with the Intergovernmental Oceanographic Commission of UNESCO in tailored capacity development and adaptation to coastal and ocean climate change; developed and coordinated the Seas of the CPLP with the Community of Portuguese Language Countries, analyzed the role of regions and proposed an architecture for the European Integrated Ocean Policy with the Conference of the Peripheral Maritime Regions of Europe; coordinated a regional integrated sea strategy for the Region of the Algarve (Portugal); and with the Global Forum on Ocean, Coasts, and Islands produced numerous analyses to feed the UN Informal Consultative Process of the Law of the Sea and the development of the Mauritius Strategy of Implementation for Small Island Developing States. At European level her work on marine conservation focused on technical groups: at OSPAR regarding marine conservation; and at EU for coastal water quality. She holds a Ph.D. in Marine Policy, focused in governance, comparative policy analyses, sustainable development and integrated ocean policies. She has also extensive experience in environmental impacts statements and produced position papers within the process of public consultation of EIAs, environmental law and strategies, specializing in water resource management and marine conservation. Her background is Marine Biology and Fisheries, with a professional degree on environmental impact assessment and 10 years of senior experience of predicting cumulative environmental impacts on watersheds and coastal aquaculture.